This Boid is about to take this kitteh to school. First, kitteh is all: "Is this thing on? tap tap"
See, Nancy P.?!? See how he did that!? AWWWW!!! How "tweet"!! Just makes me smile and think happy thoughts all day!!!! What a nice photo series! I'm glad it didn't end with just the first pic. Interspecies snorglingks ftw!! Love the last picture, kissing goodnight! Awwww I love the last photo!! Over the top, redonkulous Cuteness!!! This site keeps me going all the long workday (even though I'm a 3rd class cutologist who never gets posted). How did the kitteh not eat birdeh, he does look incrediblee nommy! 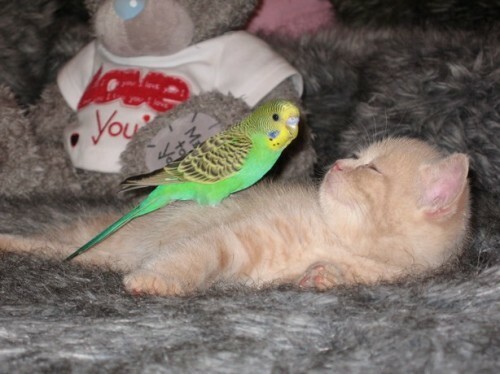 It's Babysitter Budgie! Flies in on the west wind, and flies away when the wind turns to the east, and all kittens are sweepies! This is insanely cute, omg. I love the 4th pic...the cat is totally smiling. *stop it! * All along I've been saying - no, I can't have boidies with 12 cats in deh house... They get along fine wit guinea piggehs and bunneh, but no way... no boids! *Now* what am I to do???? That is so cute Cute CUTE! I have now melted into a puddle of goo at my desk, and now my boss is going to yell at me for melting on company time and it's all your fault! 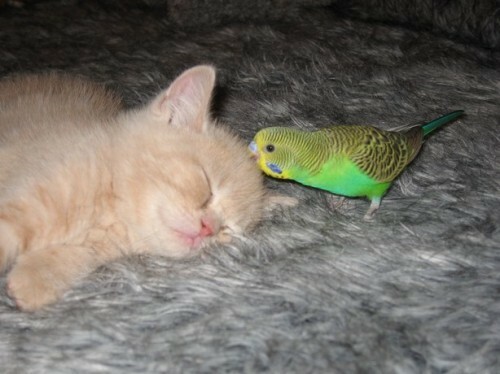 My friend just emailed this to me this a.m., and "Sylvester and Tweety" it's not. What it is, is totally adorable, and a sweet way to start my day! P.S. "...melting on company time" made me ehl oh ehl. Notice the "love you" bear in the background of the smiling kitteh photo. Such clever composish, photographer! Awwwwww!! That's all I can say right now. Awwwww!!! They both look so happy and content. And I love those captions, too! Oh wow, this is incredible. Love it! So sweeeeet! I love the expression on kitteh's face. What a lovely pair they make!! It's adorable to see an animal hitting another animal! It's even more adorable when one animal has bacteria on its claws and in its mouth that could kill the bird with a massive systemic infection with even the tiniest scratch! 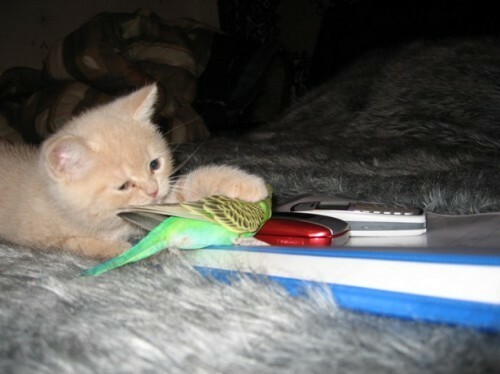 OMG, so cute to see the defenseless bird being mauled by a kitten! Are you all morons, or just braindead? The owner of this should have her bird taken away, for terminal stupidity. But, since budgies are a dime a dozen, she'll probably just buy a new cat toy when the one she has dies of ignorance, neglect, or "horrible but easily prevented accident". Oh boy. Here come the 'nuffers. Also, that is one shagadelic bedspread! Yeah baby! I had budgies when I was little. We called then "parakeets" then, before we knew The Truth! "Wet eucalypt leaves excite and invigorate both the wild and aviary budgerigar into a frenzy of joy." did you guys take your meds this morning? this is just so adorable, i love the pics, and the captions are SO dang funny. my carpooler and i go straight to COL when we get here in the a.m. just to get a smile and a laugh. and we dont need to hear you stupid Nuffers babblin garbage. Grounded, I can see your not a cat person. Since there are lots of cat pictures posted on here, one must ask the question, why do you come to this sight? Ride your high horse some were else. 'kay, these are verry sweet pictures, and the kitty looks just like my Gus when he was a baby. And I have cats and birds, and I know lots of people who have cats and birds, and some of us keep them separate because, um, well, cats is predators and birds is prey, and, um, well, kinda risky from my perspective, but there are folks out there who successfully comingle their populations. But this has been a sad morning for me, had to say goodbye to our oldest kitteh (named Bird, oddly enough), and I was really looking for some happy-making cute. So this made me smile, and, um, thanks, but like they say on the commercials, "do not attempt with your own kitteh and budgie." I just melted,,,... Too CUTE!!!!! Some people just don't get it. This is CUTE OVERLOAD not the freakin' presidential debates. Come on 'nuffers let your guard down for 2 minutes and have some FUN! Birdie is going all "I'm king of the world! The avian domain rules! Felines are powerless against our magics"
But tell me, what is that furry beast they are laying on? You can always tell when there are going to be commentroverseys here. I don't know why y'all are putting down what Grounded has to say. It's true - bacteria from a cat's mouth can swiftly kill a bird, no matter how nice kitty is to birdie. Don't live in ignorance just because it spawns cute photographs. This is the first time I have seriously barfed rainbows. I could cry tears of syrup right now at how utterly cute and schmaltzy those photos are. Love the pic, made my morning. thank doG for CO! But charliewabba, I'm sorry for your loss. Robin, the same can be said of cats and humans though. My sister had to be hospitalized after my cat bit her because the wound was infected and it spread through her lymphatic system. So maybe we should stay away from cats. Barbara - may I inquire as to the flavor of puddin' you are snackin' upon? We may be needing more. Charliewabba- so sorry to hear of your loss. Snuggle up with another kitteh, you'll both feel better. to me, suggests she is wanting an attack. to all I say get out the "Puddingkwürferschnorglekanonen." 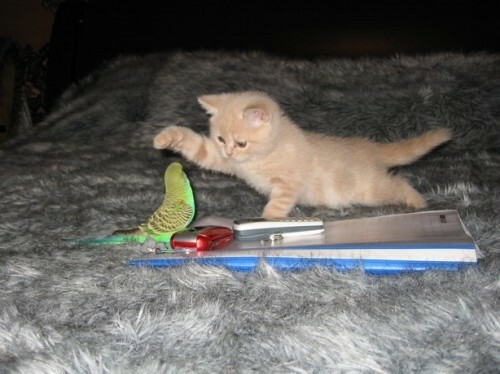 Glad the Kitteh hasn't learnt what kittehs do to boids, unlike my murderous pair. I came home to a scene of slaughter last night, Pidgeon feathers eveywhere head over there bloody remains of torso over there. All on my persian rug, natch. I love the kittens smile and thecaptions. So now let us all be warned about the dangers of interspecies slobber-sharing. cat slobber to peoples = not good. and thanks for the sympathies. I enjoyed a prolonged snorgle with my Gus cat (the yellow fur covered water baloon) before coming to work. He is very absorbent. charliewabba -- so sorry for your loss. There ain't enough pudding in the world. 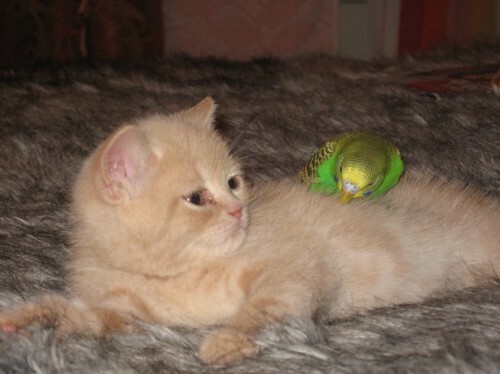 Kittehs getting along with birdies that's just soooo CUTE! AWWWW!!!! seriously, though, don't try this at home. 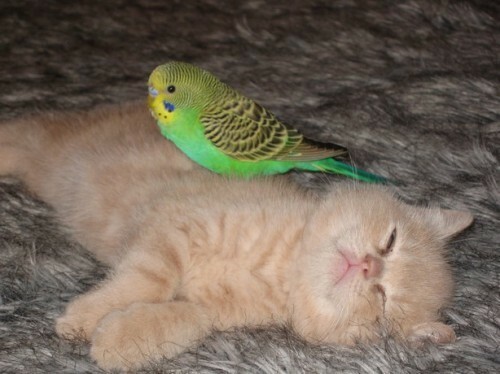 I lost a birdie to an overeager kitteh in my youth, and this picture, despite it's redonkulous cuteness, made me very nervous.